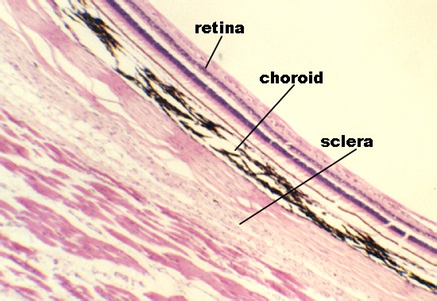 Retina, Sclera, and Choroid | Microanatomy Web Atlas | Gwen V. Childs, Ph.D.
All along the retina, you can also see the pigmented Choroid coat underneath the neuroepithelium. 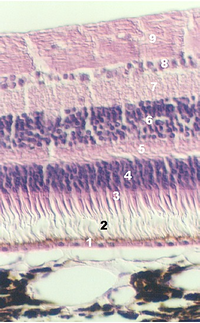 It contains three layers: the outer, vessel layer, the middle, capillary layer (choriocapillary layer), and Bruch's membrane, lying just under the pigmented epithelium. The vascular layer with its large vessels can also be appreciated in the photograph below, showing an overview of the retina. What components make up Bruch's membrane? The photograph below shows an overview of the Retina and the supporting coats. 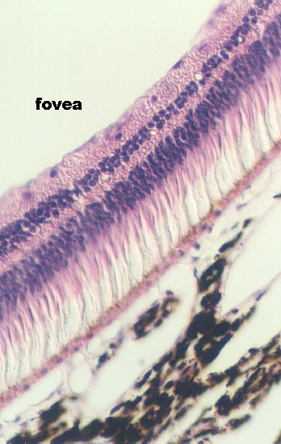 The bottom layer is the connective tissue SCLERA. 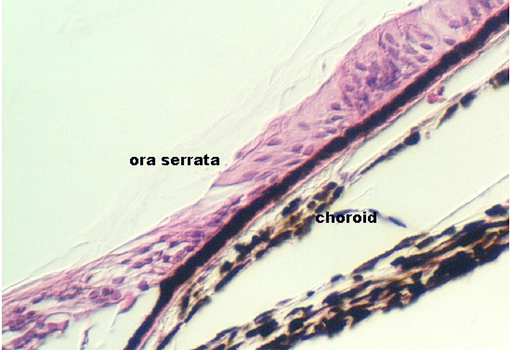 Above the sclera are the layers of the darkly staining choroid (note the large vessels in the vessel layer. A thin pigmented cell layer is seen just above the choroid ("PIGMENT EPITHELIUM). Then, the retina begins. There are a total of 10 defined layers in the retina, including the pigmented epithelium. Consult Figures in your text for a comparative view of each layer. 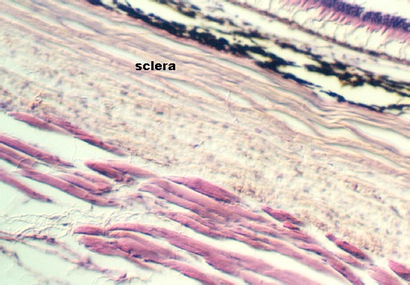 The Sclera is a connective tissue sheath that supports the eyeball and also attach to tendons of eye muscles. It is easy to find in your section on slide 97, although it may be pulled away in some regions. The next two views show the sclera and choroid in relationship to the retina (next photograph). With a higher magnification, the sclera and choroid can be seen in the photograph below. 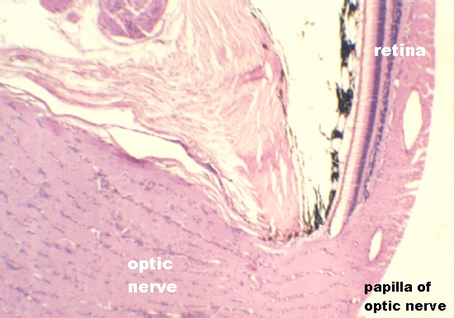 The following photographs show views of the retinal layers. We do not have the time to learn these in detail, however each layer can be defined and described briefly. The top of the following photograph is pointed towards the anterior of the eye (front). 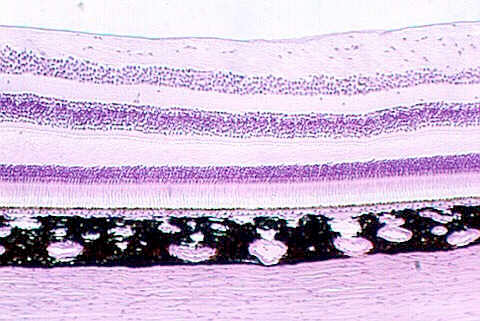 Find a fairly intact region in the retina on slide 97 and try to identify the layers. Layer 1 is the Pigmented Epithelium. There is some controversy about whether it belongs to the retina or the choroid (see your text). Where is the separation point, when there is retinal detachment? What is the function of the pigmented epithelium? Layer 2 begins the Retina proper. It is the Photoreceptor layer containing the rods and cones. Draw and electron micrograph of a rod or a cone. What are the distinctive features of the "outer segment". What are the distinctive features of the "inner segment". Layer 3 is called the "Outer limiting membrane". This is not a true membrane. What is it, histologically? Layers 4 -8. These layers contain alternating groups of neurons (nuclear or ganglion) and fibers (plexiform layers) that synapse and interplay with the photoreceptors and each other. The details of these cells and their synaptic organization are beyond the scope of this course. Some of the wiring has not been worked out. The layer just inside the neuroepithelium, facing the vitreous body and the anterior portion of the eye is the "Optic nerve layer" . These nerve fibers collect from the Ganglion cells that interconnect with other neurons in the retina. The Ganglion cells are in layer 8. They send information to the brain about the complex neural activity in the retina via axons that become a part of the optic nerve. 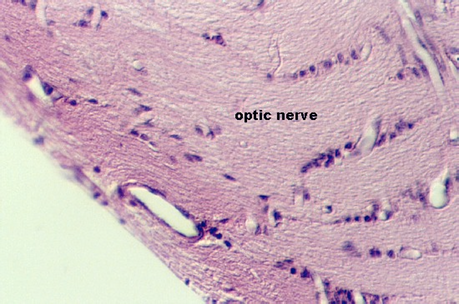 Locate the Optic nerve layer (layer 9) in your slide 97. An overview of the optic nerve seen as it leaves the eye is shown in the following photographs. Find this region in your slide. In most places of the retina, light must pass through all of the layers, including the nerve fiber layer, before it reaches the photoreceptors. However, in one region, called the CENTRAL FOVEA, the optic nerve fibers circle above and below the fovea, leaving the lower layers exposed to the light. This is slightly lateral to the optic papilla (see above photograph of optic nerve for the papilla). The following photograph illustrates the beginning section through this region. It is characterized by a shallow depression, with the concave surface facing the vitreous body. In the photograph below, you can see the pigmented epithelium, the photoreceptors, and the fact that some of the nuclear and ganglion layers are being displaced. In the center of the fovea is the area of most distinct vision. Which of the photoreceptors are found in the fundus of the fovea? Compare the vascularization of the retina in the main region (where the optic nerve is running) with that in the fovea. How does this help improve vision?